A couple 1.5 lb bricks of National Coney Island’s Hot Dog Chili Sauce with a package of Koegel Viannas. 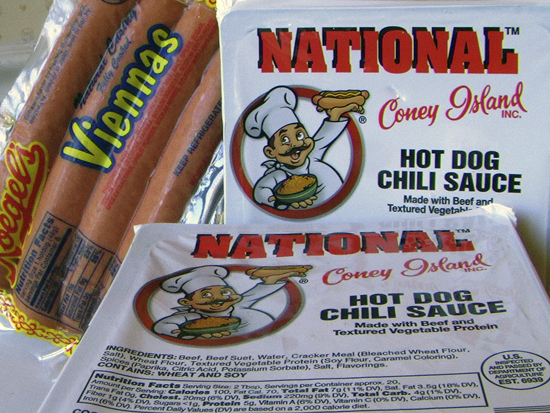 The National Coney Island web site does offer complete coney kits in a styrofoam shipping box, including buns and their own brand of hot dogs, and also offers the sauce bricks and hot dogs separately. But as per Ms. Rector’s article, Meijer is only carrying the sauce. According to their web site, National‘s hot dogs are, “Natural Casing Hot Dogs (the ones that snap !!! )” To get a similar action I picked up a package of my old coney standby, Koegel Viennas, which have a natural lamb casing. For the buns I grabbed an eight-pack of Aunt Millie’s brand which are used in many coney shops in this area. COOKING INSTRUCTIONS: For CONEY SAUCE, Add 1-1/2 Cups Water. For CHILI CON CARNE Add 2 Cups Water and Chili Beans. Cook to a Minimum Internal Temperature of 160°F. With a 1.5 lb brick of the Hot Dog Chili Sauce, you’ll end up with just over 2 lbs of “CONEY SAUCE”. My previously-described definition of the “brick” package really would have worked well for this particular product. I dumped the 1-1/2 cups water into a pan, cut the seal off the package of chili sauce, grabbed a spoon, turned the package over, over the pot and … nothing. The sauce didn’t move. I squeezed the sides of the package a little to loosen it and it finally came out in a solid chunk. Yup, pretty much a brick. I turned the heat on low and broke up the brick of sauce with the spoon. After about 5 minutes a lot of the sauce had softened up. However, as I’d not used a non-stick pan the sauce started to harden on the bottom of the pot fairly quickly. I’ll use a non-stick pot next time to solve that problem. It took about ten minutes for the sauce to soften completely, at which point I set the burner almost off just to keep the sauce warm. The consistency of the sauce is quite good. It’s not almost puréed like some commercial sauces are. There are good chunks of actual meat in there, giving it a nice body, and it has a great color as well. I grilled up some of the Koegel Viennas, nuked the buns a bit and put the whole of it together. This is a very mild hot dog chili/coney sauce. It’s a nice compliment to a full-flavored hot dog. Our opinion is that the National Coney Island Hot Dog Chili Sauce is very reminiscent of an old-style diner coney sauce, the kind of thing you’d get at the counter of a place that might have had a real soda fountain at some point. This isn’t a Flint-style, Detroit-style or even a Jackson-style sauce. 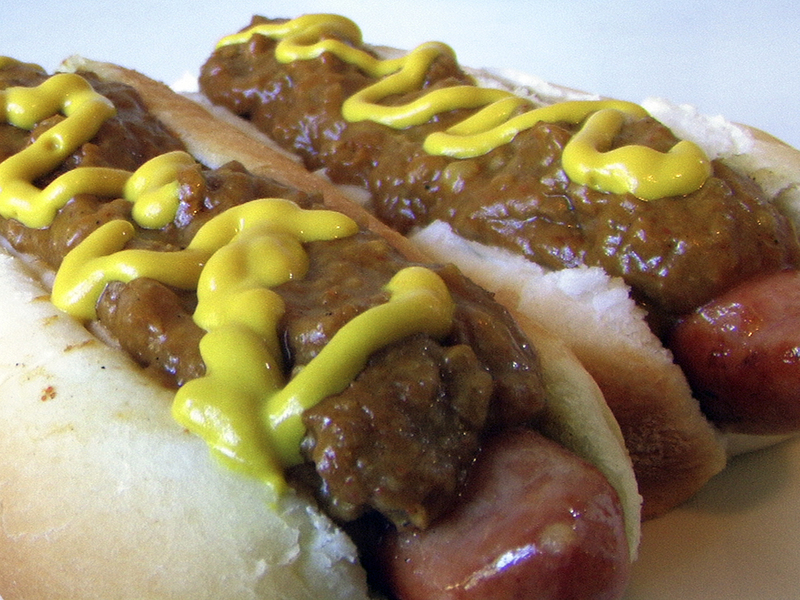 The National Coney Island Hot Dog Chili Sauce is it’s own thing, and that’s what makes it good. I can easily see myself topping this sauce with a bit of raw sauerkraut the next time I serve it. Thanks, Meijer. We’ll certainly be back for more. I’ve never been a HUGE fan of hot dogs, but those sure look like winners to me. Purchased a brick of this sauce at Meijer in Anderson Indiana. Opened as soon as i got home from the store, it had large amount of mold. I comlained to Meijer, they just said to bring it back and blamed it on the manufacturer. I did not feel satisfied, so I contacted the manufacturer direct. He returned my call immediately. apoligized, and without blaming anyone offered to send me sauce & hotdogs directly to my house to show me his product is good. He assured temps are checked in his factory all the way to the store, but after that- he’s out of control. It is my opinion that Meijer has a handling problem. The company backed its product no questions asked. National Coney Island Inc. has a superior product and a is good responsible company. Does it appear that the 1.5 lb bricks are the same as what’s used in their restaurants? BTW I think your blog is great. i tried the national coney sauce. It was good but I was really disappointed.. There are several major categories of coney sauce. First is so called comet sauce that uses tomato sauce. This is a soup, it is chili, not a coney sauce. The second in a thick meat based with a filler (cracker meal). This is the National style. It is decent but not my preference. The third is a juicier sauce without cracker meal. This is found in the Fort Wayne Coney Island type sauce. This third is thy type I grew up with and my preference. This sauce usually has beef hearts and kidney suet. Simmered a long time and the fat is rendered out. This is the only one of the three that uses flavor rather than bulk. The other sauces use so much sauce you can’t find the hot dog. The Fort Wayne style is highly seasoned but you can find all of the flavor so to enjoy. I don’t want an open face chili sandwich with a little bit of hotdog added. I want a hot dog, with great seasonings added. Hi Tom, I know what you’re saying but there’s more to it than that. There are considerably more Coney sauces than that, including sauce for White Hots in the Rochester, NY, area which are also referred to as Coneys, Cincinnati Chili, which locals call Coneys, a version in Texas that’s nothing like the Texas Hots served in upstate New York, and many others. Also, other sauces from Michigaan, actual Flint, Jackson and Detroit versions are made with beef heart as their first ingredient, which National got away from. Finally, you’ll basically like what you grew up with, as will anyone else. To discount anyone else’s preferences, or for them to discount your preferences, makes no sense. I like Flint coney sauces, which are highly varied between restaurants for certain reasons, as I started enjoying those when I was seven. I also like Jackson sauces since they’re like Flint’s. But Detroit sauces are odd to me solely because I didn’t start eating coneys there. That’s just how it works. @Tom : My great grandfather who was from Bulgaria worked at Coney Island Fort Wayne when it first opened. My grandfather has the recipe for the coney sauce and makes it on occasion. Cracker meal is definitely in the recipe. Along with the suet. Some people also forget about the cinnamon..
Kris, the cinnamon is definitely in there. I was finally able to try the coneys at the original Ft. Wayne shop a couple months ago, and found the sauce to be quite nice. The hot dogs were too small for my liking though, I’d definitely use something larger as a base. I grew up in Toledo Ohio. My dad owned Toledo Hot Dog. The sauce is a loose chili sauce and very flavorful as you said. You see the hot dog and two fork fulls of chili was plenty and a small amount of the liquid seeps into the steamed bun. Delicious and cant be beat. Now I spent my working life in the Detroit area. I am very familiar with the block chili sold in the area. There are 3 major manufactures. The best being Miltons Chili of Madison Hts. Second is National Chili and the third is Detroit Chili Company. All three are sold wholesale in 5 pound highly concentrated blocks. All are the thick variety and have their own flavor. Miltons makes a great bowl of chili with or without beans. It all depends on your taste. Have a Blessed Day.